Increase visitor satisfaction, social media followership, and the effectiveness of your business' marketing campaigns. As technology grows and becomes more innovative, more and more business owners are turning to DIY solutions and beginning to explore new ways of doing things. We live in an age where reaching out and connecting with people is as easy as pressing a button – though just as easily, someone is capable of finding you and following you online or on social media – which when it comes to businesses, can be a potential client or customer’s first impression of your brand. A business wouldn’t be a business without people coming in and giving you their time and money. That’s why any respectable business will always invest in the comfort and consideration of the people who come to frequent their establishment. The most common means of catering to the comfort of visitors is the Television. TVs hang in the lobbies of medical offices, hospitals have TVs in their waiting areas, and bars and restaurants have them so people can watch as they eat. With customer comfort being the priority it is, it only makes sense for business owners to invest in ways to make waiting areas more inviting. Those who run something other than basic cable tend to settle on one of a few do-it-yourself alternatives. People try things ranging from stiff looping slideshows, digital signs, and streaming sticks, to playing DVDs. While these options have no regular monetary cost, they provide no real value to your business. Certain solutions may be illegal depending upon what you are showing. (See the article: Using Netflix & DVDs in Your Business). 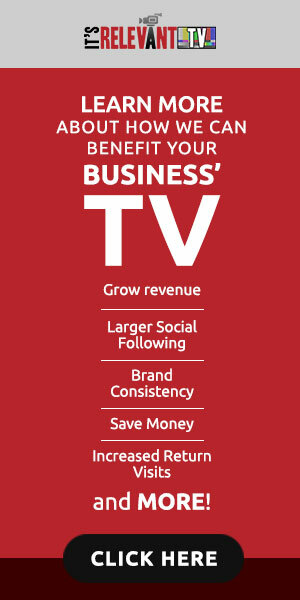 When homegrown DIY alternatives fall short of providing an ideal the answer is a custom TV network for your business. A network that brings the TV programs in legally and lets you message to your customers at the same time. With It’s Relevant TV, it’s just easy. It’s Relevant gives you access to a living network, which features short-form family-friendly content designed with business settings in mind. The service allows you to customize your TV, giving you control over which categories play and what visitors see. It’s Relevant can also be used to display posts from social media accounts in real-time. This helps you to further positively promote your brand and get people to follow you online.